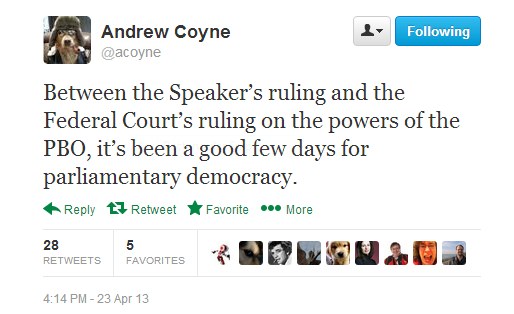 Yes, it has been a good week for those who believe in the supremacy of Parliament. Monday saw a win for now-departed Parliamentary Budget Officer (PBO) Kevin Page, who basically won his reference to Federal Court regarding whether or not the Conservative government would have to provide him with the information needed to satisfy an opposition request relating to last year’s budget. While the Federal Court’s ruling did not demand that the Conservatives provide the PBO with the documents immediately, as the PBO did not actually make such a request, it clarified the PBO’s mandate and reiterated the long-standing rule that if you create a law, you have to abide by it (imagine that). The fun part is about to begin as the Interim PBO plans to ask the government for the documents requested by Thomas Mulcair and the NDP. Prime Minister Stephen Harper is no fan of the PBO, even though he created it and appointed Page. During Question Period yesterday, Harper referred to Page as a partisan. I’m not sure what Harper thinks he can gain from this fight. It continues to reinforce the image of his government as a bully and that it has something to hide. The fact is that MPs have very little information about how our taxpayer dollars are being spent. We need a PBO to help our MPs dig through the partisan nonsense and figure out where our money is going. I guarantee that if the Conservatives were the opposition and the NDP were the government, they’d be crowing about the need for transparency and accountability. The 15 minutes set aside each day for MPs to stand and speak about any matter of local, national or international concern is governed by lists: lists determined and provided by the party whips for the purposes of guiding the Speaker as to who should be called on to stand and speak during those 15 minutes. There are lists as well for Question Period. If your party whip does not wish you to be there, you are not on the list. And if you are not the list, you do not stand to make a statement or ask a question. It has been this way, more or less, since 1982. “Even if not enshrined in the Standing Orders, generally the House has been well served by this collaboration and the lists have helped the Chair to preside over this portion of each sitting day in an orderly fashion,” the Speaker offered. At this point, I rolled my eyes and thought that was the end of it. Scheer basically concluded that because the Speaker’s authority is based on rules created by Parliament itself, he couldn’t go beyond that unless Parliament changes the rules. It is, in the Speaker’s estimation, still he who possesses the authority to determine who will speak next. And it is, in all cases, for the members of this place to, as they say, catch the Speaker’s eye. And here the one sentence of these 2,700 words Andrew Scheer spoke that mattered most. Here is the principle—the unalienable right—that trumps both the list and the list-maker. In other words, I (the Speaker) abide by the list because that’s what you fools give me. If you’d get off your asses and stand up, I could recognize you. Until then, I’ll go by the list because that’s the order in which you get on your feet. SO STAND UP, PARLIAMENTARIANS. STAND UP AND MAKE YOUR VOICES HEARD. I find it inexplicable that MPs have been operating under the assumption that they are beholden to those lists provided by party whips. Once again, as an MP, you do not represent your party; YOU REPRESENT YOUR CONSTITUENCY. You are a free agent, of sorts, able to do whatever it is you need to do to represent your fellow citizens. Parties are simply a means of organizing MPs in order to get Parliament’s business done. Parties do not rule Parliament; MPs do. While I am flabbergasted that things had to go this far in order for MPs to learn what the hell their job actually is, at least the matter was settled. So what happened in QP? Green Party Leader Elizabeth May got on her feet after every question/answer series in order to try and get a chance to ask a question. Unfortunately she didn’t get a chance to speak. Question Period has its own rules in that each party is to be given a certain number of questions. As for Warawa, he got on his feet during Members’ Statements and was recognized, although it seemed kind of planned. And his statement was about a Langley talent show. You’d think that after all that, he’d use the occasion for something a little more profound (no offence to the Langley talent show contestants). So there you have it. Two important rulings which demonstrate that Parliament isn’t dead yet. It’s up to MPs now to take these rules and run with them. If they don’t, things will remain as is, and I think we can all agree that that’s unacceptable.